If you offer a price match service to your customers, this is a huge time saver for you. 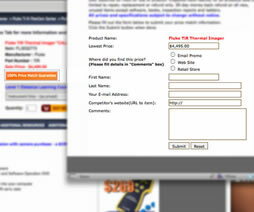 This feature will allow you to attach a price match request button to each individual product. Clicking on the button will open up a form that is pre-populated with the item information that will allow your customers to specify where they saw the lower price, what it was and information on how to contact them. The entire form then gets emailed to you directly.